Gaeran mari, or stuffed egg omelet, is another popular side dish that is commonly found in Korean dining tables. While preparing and making gaeran mari is incredibly easy, Koreans never get tired of this dish because of the versatility of the ingredients that can be found stuffed inside the omelette. Different variations can include but not limited to onions, carrots, spam, dry seaweed and much more. 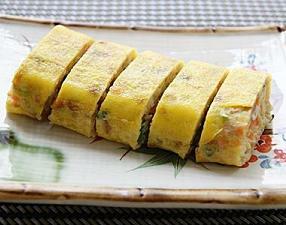 While its recipe is simple, close attention is needed to make a fine and beautiful shaped omelette roll. Along with various side dishes, this egg dish is a favorite menu item since it's perfectly balanced for a light meal, especially for breakfast or lunch. It also serves as a great compliment to offset some of the spicy flavors which are quite common in Korean foods. Chop green onion into very fine pieces, smaller the better. Dice spam into very tiny pieces, smaller the better (optional step). Stir and mix all ingredients together. Over medium heat, coat a frying pan with oil. Pour in mixture and evenly spread the egg all around by rotating & tilting the pan over medium heat. Allow it to cook until one-side of the egg is settled and semi-firm. Turn heat to low. Place dry seaweed sheet(s) to cover majority of the surface (optional step). When egg is firm enough, gently fold ⅓ over and press, and then fold the other ⅓ over and press. Cook both sides until firm. Remove from heat, cut into ½ inch thick pieces and serve.